Flames! 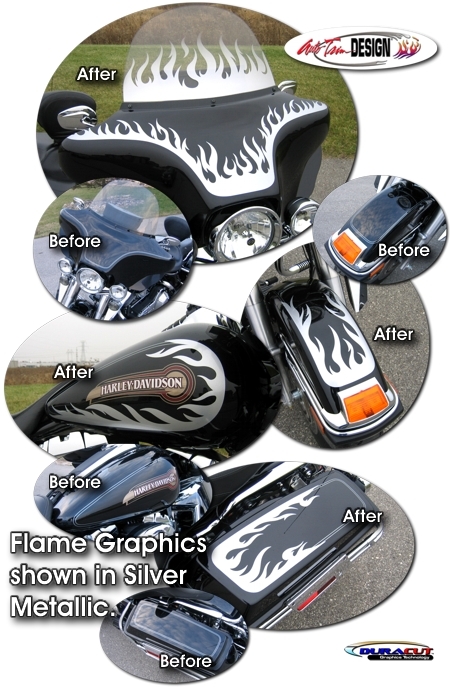 Dress up your '93-Current Electra Glide with this precut, easy-to-install graphic kit! This six (6) piece graphic kit is uniquely designed to precisely cover the Electra Glide factory pinstripes as shown. Available in a wide variety of colors, these graphics with traditional flames look great! Please note: This kit is uniquely designed to precisely cover the Electra Glide factory pinstripes and will not cover the Ultra Classic pinstripes. Notwithstanding, this kit may work well on solid color Road King, Street Glide and Ultra Classic Electra Glide bikes. Windshield Flame Graphics (ATD-HRLYTOURGRPH2) shown in the picture are not included with this kit. They may be ordered separately.